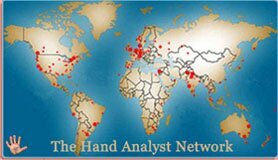 "I am a Master Hand Analyst certified from the International Institute of Hand Analysis. I am a specialist in elemental energy, fingerprints and all line formations. With this I take you through a 1.5 hour journey to construct your personality from the ground up so you can fully realize the destiny you're on. Afterwards a brand new life and possibility will be clearly evident for you. See the testimonials for a before and after the session. The analysis is magical!" Discover how much of your life really does show up in your hand by testing the world's best palm readers after we compare against the interview.